This article was just passed around here at work and I found it interesting. I debated whether to post it here or in the GPS and Technology forum, but decided on here given its general relevance to geocaching. TL;DR - The iPhone (4 and 4S tested in this study) is very accurate, but still not as accurate as a dedicated GPS. On average, the dedicated GPS units are about 5-6M more accurate. This is a great first test. I'd be very interested to see if different applications have different accuracies. I've always found that my GPS is more accurate, but I can find caches just fine with my 4s. When it comes to hiding caches, or for a newer cacher finding caches, I can see where the average difference in accuracies can be a problem. Meaning, I've learned how to tone down my drunken bee dance! Never had a GPSr and the longer I go without one, the less likely I am to bother spending the money. If the time ever comes for me to try caching in places where there is no real cell coverage, then I'll consider a low price one...but as it is, I pretty much always cache in areas with coverage. So far, I'm very happy using my smartphone instead of a GPSr. I purchased an ExploristGC but, I find it clunky and cumbersome. The smartphone is just so easy to use, I don't feel the need to switch. If I find myself in an area without coverage I have a device to go to. Of course I'll have to load in the maps/caches for that area first, which is no easy task for a new user provided the pathetic "user manual" the explorist came with. In fact, without the help of these forums, I wouldn't low how to use the thing at all. I think the important part to consider in this study and our real-world use is that the phones all work great for finding caches. It's the hiding of caches that becomes a problem. Finding is easier: One puts the phone or GPS away when the distance to cache is <30ft, and starts the search. Plus, this study doesn't address rural/remote accuracy, and certainly doesn't address other strengths of dedicated GPS units like waterproofness, battery life, etc. Cellphones are fine for urban caching, but if you are hiking anywhere remote without a cell tower, forget it. My phones have worked fine for geocaching even when I've had no cell connection, or when they've been in airplane mode. The main issues with using a phone in more challenging terrain that I have are durability, waterproofness, and battery life. I have used an iPhone 4 and 4s, but presently primarily use an iPhone 5 for urban geocaching and an eTrex 30 for suburban and rural. There is a big difference in screen redraw speed between a 4 and a 4s, but not as large a difference between a 4s and a 5. I have also used a waterproof case while caching to protect the phone. I have even used the iPhone while geocaching in Europe and found it to be very good. To save on roaming charges I would use wifi and log onto the website with my iPhone and create a PQ for the areas that I would be visiting. It was then a simple matter while still on wifi to upload the PQ (including offline maps) to the phone using the official App for use without need for cellular data. This is a great feature! Also, the iPhone is better than a stand-alone GPSr when travelling as I didn't need to have access to a computer to link to the GPSr to get the geocaches loaded. The need for a computer link is definitely a problem when travelling with a GPSr. In addition to the iPhone I have an external GPS (Bad Elf Pro) that can connect to the iPhone with Bluetooth for improved accuracy. Bad Elf also makes devices that plug in to the data port (lightening or 30 pin). I have found that this is not a large help when searching, but improves the coordinates for placing a cache. One feature that is missing in the official App is turn-by-turn directions to navigate to a cache. For this I have also installed L4C which uses the GC API to allow me to download nearby geocaches and allows me to link to Maps or Navigon, for example, to get street and road navigation to the cache site. Worth noting, however, that people would need to remember to download (save/PQ) caches, and map info if they want/need it when they are caching with a cell phone outside of their data reception area. You have not participated in all aspects of the game; you have not hidden any caches. All handheld GPS units these days, regardless of manufacturer, come with a "pathetic user manual", and you have to get the full manual online, usually in .pdf format. Consider that more help, if no one has mentioned that already (and it doesn't sound like they have). I thought it was fairly well established that cell coverage really doesn't help that much with more up to date smartphones? You don't NEED cell coverage - or for the UK, a mobile signal - to cache with a smartphone. GPS is independent of those signals. You store caches at home for offline use, and away you go. For those who can't justify the expense of a dedicated GPSr or don't wish to, you can do perfectly well without one. (n.b. Yes a smartphone can be expensive, but you already have one, or you wouldn't be caching with it. See above re. data usage/costs. If you should want to see if there is a cache nearby, off the cuff, then yes, you'll need a signal and will use data downloading those details. Then you store it, and off you go. Again, for seeking caches, yes. Phones are great, and you don't have to have a data signal to use a smartphone to geocache, so long as you have saved caches and maps for offline use. You don't need cellular data to get GPS coordinates for placing a cache. There are several apps that will also average coordinates to get a very precise location. This study shows the contrary is true. I know you don't need a data connection on a phone for GPS. I'm no numpty on these technologies. This study shows that the GPS in smartphones is not as accurate as a dedicated GPS. Certainly more study is needed. Including what I mention above, such as different apps, different locations, etc. This was a collegiate study, and a more longitudinal study would need to be made to draw more significant conclusions. We have an example of an actual study that opens the door to discussions supporting or refuting claims about GPS unit/Smartphone GPS accuracy. The thing that gets glossed over here in the forums and this thread is that geocaching is not the application these researchers took on. They only looked at coordinate find accuracy. They were not looking for a container near the coordinates, and they were not using hints, "geosense" or the like to come up with their precise "ground zero". Therefore, we cannot say that this study supports or denies that finding a geocache is more or less possible with either GPS device. What this study shows is that smartphones (iPhone 4 and 4s) do not have as accurate a reading as a standalone GPS when seeking actual coordinate points. Finding a cache means getting near GZ and looking around. That's not an example where this study is applicable. We head to GZ and start looking when we get "close" to where our device indicates GZ. We search in a radius. This study looked for a point, not a radius. It wasn't looking for the general area, it was looking for a point. Therein is why this study is more relevant to hiding a cache than finding a cache. Now, is this study a "nail in the coffin" for using a phone to hide a geocache? Not at all. But it does bring some actual tested and verified facts to what some have claimed to be true all along. Now, if you don't believe this study was conducted in a controlled enough setting, or that its findings are incorrect, then conduct a study of your own. Simply offering anecdotal evidence or using your opinon do not a solid arguement make. We have a study to start from, and perhaps other academics will take on additional study of the same kind to support or refute this finding. It's science. It's research. That's how it goes. I needed a break from what I was slaving over at work, so being curious I grabbed my phone, turned on the GPS and fired up Google Maps. My phone is just some El Cheapo Android based Verizon thing. I'm currently inside that building, where I am sitting right now in my office is slightly to the right of the blue arrow by about 6 feet. Not bad accuracy for being indoors. Or lucky, which is probably a more accurate statement. With that said, we've never had a problem FINDING caches with the official Geocaching app on this phone. It always takes us reasonably close, at least close enough to the hide spot it isn't rocket science to figure out where the cache is hidden. We don't always use it, mainly it's just a the spur of the moment thing, when we don't have the GPS with us. However, we ALWAYS use a dedicated GPS (Colorado 550T) when placing caches, or on longer hikes out in the middle of nowhere. Never had a complaint on bad coordinates with it. Anyway, YMMV. It was somewhat amusing to me, so I thought I'd post it. Interesting article. I'm reminded of where the GPS technology was 10 years ago versus today. Even 3 or 4 years ago I remarked in the Technology thread how interesting it was when people were griping about the caches not at the expected GZ with their new standalone considering the standard of 5-10 meters off was an acceptable combined error back when I started and now the standard for standalone is within a combined 2-3 meters error rate. My Samsung Galaxy S1 had a very cheap GPS and poor supporting software where the error position rate was 30 or more meters off when the onboard GPS was used as a standalone. My S4 is doing much better at keeping my position correct, but I haven't done any tests with the GPS to see how much better. I'm of the opinion if I need (relatively speaking) pinpoint accuracy, I'm still more inclined to use my standalone DeLorme GPS. I haven't placed any caches yet because i want to do a good job of it, and I think a little more experience will come in handy. I've already seen the product of people with little or no experience in the game placing caches. I still feel my experiences with the iPhone vs. the GPS are relevant here. The iPhone was just easier to work with. The GPS was an obstacle and nothing more. Clearly there are circumstances where the GPS is going to do better ( that's why i bought one). But, the smartphones are pretty darn good and improving. I'm sure over time I will learn to use the GPS more effectively but, I have little incentive to bother at the moment. Interesting study. I have brought both my gpsr (Montana) and my iphone 5 (geosphere) with me while hiking out for caches. For my purposes, they each get me within feet of each other. Whether they get me to the cache is another matter (I found a cache a few days ago that was 100 feet off from both devices). I would not frame the discussion in terms of replacing a dedicated gpsr. There are certainly times when the handheld gpsr is the tool of choice, and as long as I have it with me, I can transfer a gpx file from the phone to my unit should it prove necessary. If I am placing a cache, then the handheld offers a number of advantages (accuracy, the ability to determine the number of satellites, and increased confidence that comes with using more than one type of device). No need to use data. Just walk the ~50 feet to the nearest branch of Charbucks/Costa/Nero/Mcdonalds/whatever and use their wifi. I have an app which allows me to use the wifi of any other user of the same network who has opted into the programme (run by the largest ISP in the UK). If there are homes or businesses anywhere nearby you can bet at least one of them will have a signal I can use. More likely than me being near one of those outlets, as I don't do much urban stuff. Precise must be a term subject to definition. The weak link in a process utilizing reception is the ability of the antenna to absorb signal, and relay that signal to a processor. This is often, mistakenly, referred to as antenna 'strength'. Whilst the term is not technically accurate, it will suffice for this conversation. Since even the most modern cell phone still uses (relatively) antiquated patch style antennas, they lack the 'strength' for precision. For finding caches, so long as you have a clear view of the sky, and a decent satellite constellation, cell phones are just fine. They'll get you to the point where your geosense should kick in. But to suggest that a phone is as precise as a high end handheld is to ignore science. For caching-yes people could argue it has already started to replace a dedicated GPSr. For other things? Well Garmin, Magellen, and Tom-Tom are still around. If smartphones are so great why are they not used in jumbo jets, cruise and tanker ships, or guided missiles? Oh Moun10Bike, you start the funnest threads! ...I would certainly always hope and expect the best dedicated gps device to have a better accuracy than any smartphone. It is dedicated to GPS reception. It'd better be the best at it! The results of the study do not surprise me, and for what it's saying, I definitely consider it to be valid - I'd be greatly surprised otherwise! I don't even see what could be debated in this thread - and I'm a smartphone evangelist! Now place the article in the context of geocaching, and I believe the other points made here are correct - you most certainly can find caches with a smartphone, and you can place and hide caches with a smartphone. Of course, where "smartphone" refers to a recent model of higher end device (ie iPhone 4/4S, Androids of similar class, etc). Bad coordinates can be posted even from dedicated GSPrs - cache listing coordinates are only as accurate as the CO who posts them allows them to be. That said, it's more likely that coordinates are more trustable coming from a GPSr, depending on the model they use. It's absolutely necessary to qualify, when comparing, "dedicated GPSr" and "smartphone" with their brands. It's unfair to both device types to blanket-label their accuracies. "Smartphones" aren't all bad, just as "Dedicated GPSrs" aren't all near-perfect accuracy. * The best "dedicated" GPS device should be more accurate than any "smartphone". * A mid/high-end recent smartphone brand and model is almost certainly sufficient to hide caches accurately. * When hiding caches: Regardless of device used, its handler should know how to produce and provide the best coordinates the device can calculate. I just read the "study" and I see a couple of glaring flaws with it already... even thought they used 2 GPSr's, they used the same make and model as well as the the smartphones were both Apple phones just on differnt cell networks. Where the phones 3g, 4g? I assume that data was on to assist the phones in gaining position. What I would like to see done with a real study is multiple phones over multiple networks as well as both OS being tested against multiple makes and models of GPSrs. Till then, as it was said in the article, it was a good experiment. I, right now, use a smartphone for both finding and placing caches. I have the usual apps for finding, and when I have questions about how many satilites I am seeing, accuracy, etc, I have an app or 2 for that as well. My choice of phone was based on that I needed one to hold up to what I could throw at it and so begain the research... many reviews later and I decided that the phone that would suit me was the Casio Commando and I could not have been happier. Jump forward 2 years and they updated the Commando with improving the GPS accuracy. I was sold and once again, I could not be happier with my Casio Commando 4G LTE phone. It gets me to the cache with near pinpoint accuracy, yes it is still flawed, but I have seen my accuracy as low as 3ft (yes that is FEET not Meters). I have been caching on occasion in areas with limited or no cell coverage and my phone has still performed quite well. Granted, yes, I have to watch my battery life while out and about. There are pros and cons to both the Smartphone as well as the dedicated GPSr. To answer the question presented in the orignal post and the "study," I have to say, in my opinion, that, NO, a samrtphone can not replace a dedicated GPSr. If it could would the US military not have done so already? Until the GPSr in a smartphone catches up to or exceeds the dedicated GPSr it can not fully replace it. In most urban, suburban, and some rural settings, the smartphone can substiute for a dedicated GPSr, but can not fully replace it. So when you strip the phone and GPSr down taking away all the bells and whistles, you are left with a few basic components to test, accuracy and reliability. It is no secret that a smartphone's GPS is at the same point as the GPSr was a number of years ago. The dedicated GPSr has the edge and always will because that is its only job, to watch the satilites and tell you your position on the earth. A smartphone is mutlti tasking like there is no tomorrow, so everything with it is a compromise. So can a smartphone replace a GPSr, not right now, but maybe it is possible some time in the future. This study shows that the GPS in smartphones is not as accurate as a dedicated GPS. This study shows that the GPS in two specific smartphones is not as accurate as the GPS in two specific dedicated GPS units, assuming that the "canonical" location against which all units were compared is the one indicated on the satellite/aerial imagery. My experience is that my (Android) smartphones have been about as accurate as my old yellow eTrex (which lacks the high-sensitivity receiver of the 60CSx devices used in the study). A lot of geocaches have been hidden (with perfectly acceptable coordinates) using devices like that. So, where do we draw the line? Is a GPS device with a quad helix antenna acceptable? A GPS device with a patch antenna? A combined GPS/GLONASS device? A plain GPS device? A GPS device with a modern high-sensitivity receiver? An older GPS device? A GPS device costing $500? A GPS device costing only $100? This is re-tempting me to put out a cache that also asks people to stand at a physical marker and share the best coordinates they get with their device, so in time they can be plotted. Not an ALR, but purely for interest's sake. There's another local multi here where you get info from a few survey markers; but the CO just makes it a point of interest to compare your reading with the catalogued GPS locations. I went to use the old geko, but found it not so friendly as the iphone. I need to find the cable so I download some coordinates to it, but part of me tells me not to bother. The ihpone is working pretty good. Don't read my post as a generalization. It refers to the study alone. Before generalization can be a fact, we would need to undertake the complete, longitudinal study of control GPS units and Smartphones. Meaning, this study isn't definitive, but it does find that dedicated GPS yield better accuracy than iPhone 4 and 4s. This study supports my own anecdotal evidence. Now, knowing the "accuracy" of the GPS and phone is one thing. Seeing "15ft accuracy" isn't the same as plotting a point and an accurate return to that point. You see, we're talking about different fruits. I have a 3G iPhone which is a few years old, and the maps do not work at all without any service. The accuracy is terrible anyhow, as I never have it any better than .1 of a mile. I use the aerial picture to find any caches, as my location is way off, sometimes by a few miles. It may be damaged, but I refuse to upgrade it until it is completely nonfunctional. The accuracy is terrible anyhow, as I never have it any better than .1 of a mile. 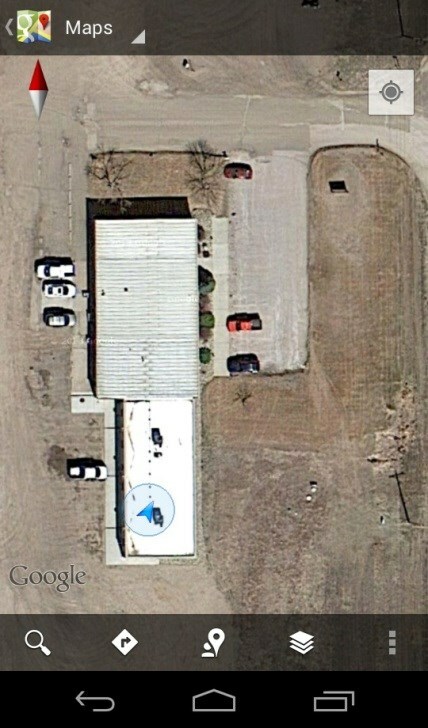 I use the aerial picture to find any caches, as my location is way off, sometimes by a few miles. It may be damaged, but I refuse to upgrade it until it is completely nonfunctional. Well, it is an extremely low-end, long since discontinued handheld GPS model. Just sayin'. There's a virtual (GCGJ8C) that does "suggest" to folks that they post such a photo. Funny thing is, many folks had their GPSr devices show them being off by several feet...and my lowly Galaxy S3 had it down to around 0.8 feet or so. The iPhone has different GPS chipsets from other smartphones like those from Nokia, HTC or Samsung. Thus an iPhone is not representing every smartphone as such. Neither is the Extrex 30 the same as every other GPS. "You must also provide coordinates to the tallest part of the system, determine the distance between your coordinates and the last person logging a find"
Although it isn't used to compare accuracy of different devices it's any interesting use of ones GPS unit to demonstrate the "science" related to that earth cache. It's one of my favorite earth caches. We probably spent an hour up on the dunes just wandering around. Further obfuscating the study linked in the OP is the indeterminate chipset(s) of the dedicated GPSr units used. According to this, the unit changed its GPSr chipset mid-production. Not really. Everything else works fine. I suppose its triangulating wifi signals and using cell towers as references, but the accuracy was never good at all, even when new. It's gone from 150 feet to 500, but at least I have a satellite image which is often more useful than a GPS map. I once did an earthcache that required you to measure elevation with your gpsr. Many do that, but the particular CO would only accept answers within a given range from that he took with his gpsr -- I forget the required range, but it was much closer than the elevation accuracy level of many units. My gpsr took a different reading than his, and as we were going back and forth about it, I wondered at the time what my then iphone model (3Gs) would have reported. Of course there is an app for that, and now I would use that and take a screen shot of the result. Perhaps the subject of what gpsr or smartphone reports the most accurate elevation is for another study. I was only really commenting on the accuracy of the compass tbh - sure, maps won't necessarily come up live but pretty much I'll always download caches and maps if I know that I want to use (my wife's) phone. In general data will be turned off as well - certainly if we're out the country which is where we use it most anyway. I guess the accuracy of the phone might be it's age btw - I believe from iPhone4 onwards the accuracy's better. Smartphone already has, just google GPS Sales dropoff. The manufacturers are scrambling to find new market. Garmin is making fitness monitors--new one comes out in a week or so, an action camera. If you want a GPS, the prices will be tanking soon as they try to clear inventory. Auto gps sales are way off. Smartphones are also replacing music devices, cameras, camcorders and who know what else all when people put them on vibrate. I'll often download PQs to the app on my iPhone when I'm out of the country but only so that I can view the listings offline. At $20 per megabyte for data roaming I keep data turned off when out of the country. I know that map tiles can be downloaded but it's very slow and takes up a lot of memory. I'd rather use the open street maps for garmin as I can easily select tiles from several regions and have them available on a removable micro-SD card in my Garmin Oregon. I can completely see this on a general consumer level. Everyone has a cellphone these days, and the iPhone's launch changed the market on smartphones and celluar data. Even Blackberry is taking a hit versus other smartphones. People are ditching land lines, and the functionality of smartphones for everything from planning to calling to videos...blah blah blah...makes them very attractive options. But, dedicated GPS units will also continue to advance. I think GPSrs starting with the Oregon really tried to integrate what people could find in a smartphone, but wanted in their GPS. Now there are cameras, touch screens, and more on consumer GPS units. All of this to say, I think that GPS units will always have a niche. And, to that end, finding geocaches will always be easy with a smartphone, an App, and an account. But, there are many things that make a GPS better in many situations, and until they make a waterproof, shockproof, ultra-long battery life iPhone, I'm hanging onto my GPSr. I exclusively and successfully find and hide caches with my Android and have sold my Oregon 550. Nuff said. Can someone please explains this to me? I have the iPhone 5 but when there is no signal I can do anything geocaheing wise. What step am I missing? The GPS functions are not dependent on cell coverage. The iphone should receive satellite signals regardless of the phone's coverage, but to cache offline you will need to have cache information saved to the app you use. It might also help to have offline maps. I use Geosphere to download the cache information and save it automatically. I also use pocket earth, Gaia GPS, and Navigon for offline mapping and routing. Other people save cache information on the Groundspeak app or any of the various alternatives. On the Groundspeak app you can save caches for offline use by pressing the button with the three dots on the list page. But either way, the iphone 5 should work for caching outside of cell coverage. With that said, there were times on a recent visit abroad when my iphone 5 was taking an extremely long time to locate satellites. I was glad that I had my handheld with me or my wife would have lost patience. I have not had that problem caching outside of my carrier's cell service in other situations. Yes and why the iphone is so much better. I can use the app and make my log entires instantly. I don't have to "send" cache coordinates to the GPS. I started to look at buying a new GPS, but there's no reason why I need to. I've found the iphone to be pretty fairly accurate. As long as it gets me within 25' or so of the area, I'm good. Sometimes even further away. After doing a few caches, you kind of pick up on the hiding places. And no matter what, no GPS is going to tell you exactly where a cache is, if it's hidden good. And then you have to take into consideration of what the cache hider used to mark the coordinates and how decent they are at figuring out that they have good coordinates or need to shut it off and redo it. The iPhone may haves a mediocre GPS chipset and maybe even poor firmware. How about other cell phones? A iPhone is not representing every smartphone because there is a wide variety of smartphones with all kinds of gps units and firmware. Comparing one type of smartphone with one type of gps and in different circumstances doesn't say anything. This discussion is the same as comparing black devices with yellow device. The Old iPhone models may haves a mediocre GPS chipset and maybe even poor firmware. How about other cell smartphones? A single iPhone model is not representing every smartphone because there is a wide variety of smartphones with all kinds of gps units and firmware. Comparing one type of smartphone with one type of gps and in different circumstances doesn't say anything. Just as you don't compare "iPhone" with other brands, you don't compare a single model of iPhone with the entire series. Any iPhone from 4S and up greatly out-performs lesser models, and the 5S specifically is among, if not sits at the top of, the best gps-capable smartphones on the market. fyi.